Along the skyline a patchwork of skyscrapers sits perched upon the rolling hills of San francisco. Down at the port our bicycle wheels roll peacefully along the waterfront.. Pedalling away from the luxurious ferry terminal with its tempting food stands, we head towards the hustle and bustle of Fisherman’s wharf. 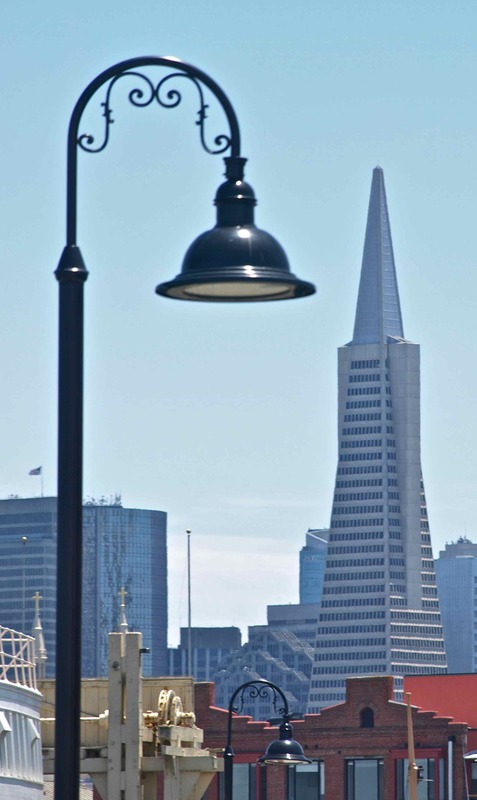 Our cycle route is part of the busy Embarcadero road, it takes us on a direct route through a hub of activity. You can’t miss Fisherman’s wharf with its huge sign encouraging you to come and explore its labyrinthine of colourful wooden buildings which rest over the ocean. We dismount our bikes due to the amount of people strolling about. 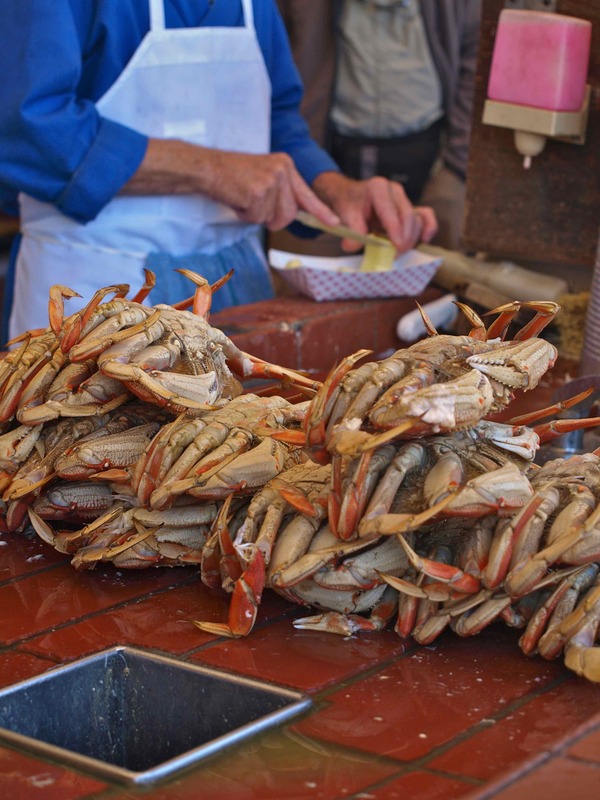 There are a number of enticing seafood stalls offering chunky clam chowder. Above the seagulls screech flying in ravenous circles looking for scraps left behind by people’s oversized snacks. It is the wrong time of year for the seals that are usually found sun baking on their bobbing pontoons which sadly sit empty and quiet. We discover an old penny arcade housed in a huge warehouse and happily spend an hour or more playing with the relics of the past before mounting our bikes again and continuing with our journey. The sea air is enticing so we follow it down a pier towards a small but interesting collection of boats. The boats are part of the maritime museum, which is worthy of another stop. Our bicycles must feel abandoned by now. They have hardly had a work out. Walking back down the pier the city clutters the blue sky, like a mountain range with a tin of shiny paint. 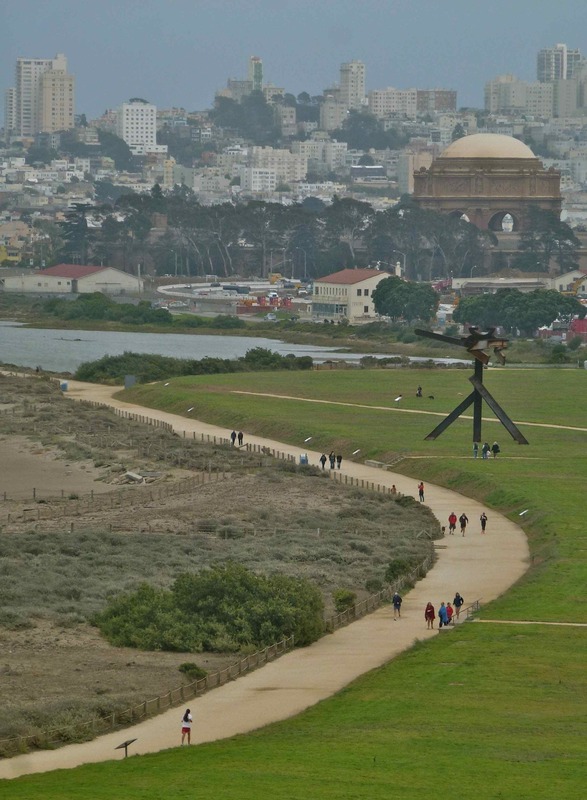 Back on our bikes and our pace picks up as we follow a path that guides us around the calm harbour waters, up a steep climb to weave us through a busy park full of joggers, lovers and picnickers into the deserted America’s cup spectators park – there is always something to distract us. The spectators park has a tiny handful of curious people poking about at the set up. Luckily a boat race is scheduled for the day ( NZ vs Italy), but hardly any one has turned up to watch? We wait for the race to begin finding a great spot right on the water’s edge. I didn’t expect to see such speed from the boats, but these boats move as if they had motors on them – they zip by slicing through the water with acceleration like that of jet plane! It was a real spectacle, I felt like a child at christmas time bubbling with excitement. The New Zealand boat won which made us even the more excited. We pedal onwards feeling very satisfied with ourselves. 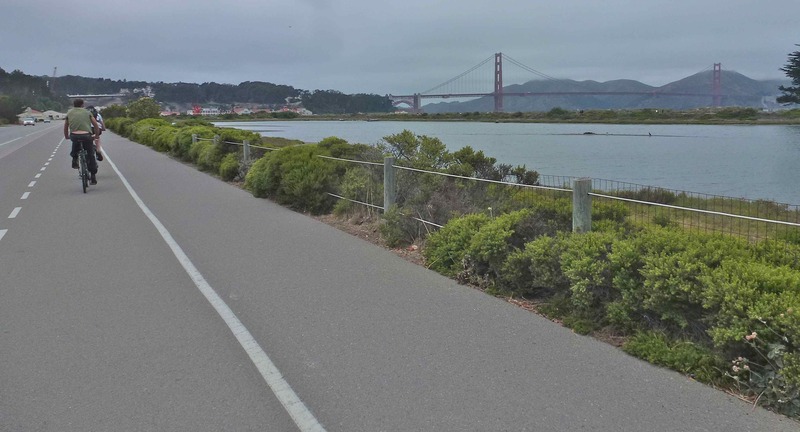 It isn’t long before the cycle path comes up beside the busy road full of noisy trucks, huge cars and the stylish motorcycles all heading in the direction of the iconic Golden Gate bridge. This is where our legs are made to work with an incline that even our lowest gear struggles with, but we all make it to the top where there is an area to rest, take photos and learn a bit of history about the area with many boards dotted about the place. The place is a hive of activity, other cyclists come and go. 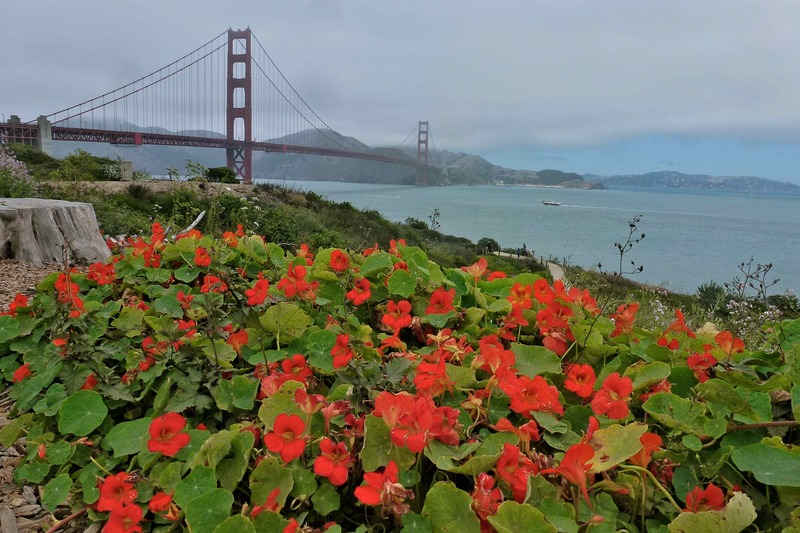 The ruby-red pillars of the bridge stretch into the Californian mist. The closer we get to the bridge the more we realise the real scale and size of this classic piece of architecture. Pedalling on the bridge you eventually become aware of just how small you are. With only a metal fence between you and the roar of the traffic, the cycle path is shared with pedestrians which makes for tight squeezes and an opportunity to test your balance and agility on two wheels! The liquorice strap wires holding the bridge upright are what you imagine a beanstalk to look like, Jack could have slid down the twisted metal to escape the clutches of that bellowing giant. Pausing to stop we experience the chaotic roar of the traffic, the rough white waves rolling in the ocean below, the mystical damp mist floating in the distance while the wild blustery wind pelts our skin. It makes me feel very much alive and ready for action. Free wheeling down the bridge was like the bicycle had a motor on it! It was a joy to turn off away from the busy traffic onto a much quieter road towards the colourful coastal town of Sausalito. With the cool ocean breeze on our tail we pedalled through the hills and past quaint beach side homes to the main street which sits like a decoration on the waterfront with views to die for. Sausalito was busy, very busy. We hunted around for lunch which ending in being a delightful deli full of fresh food. 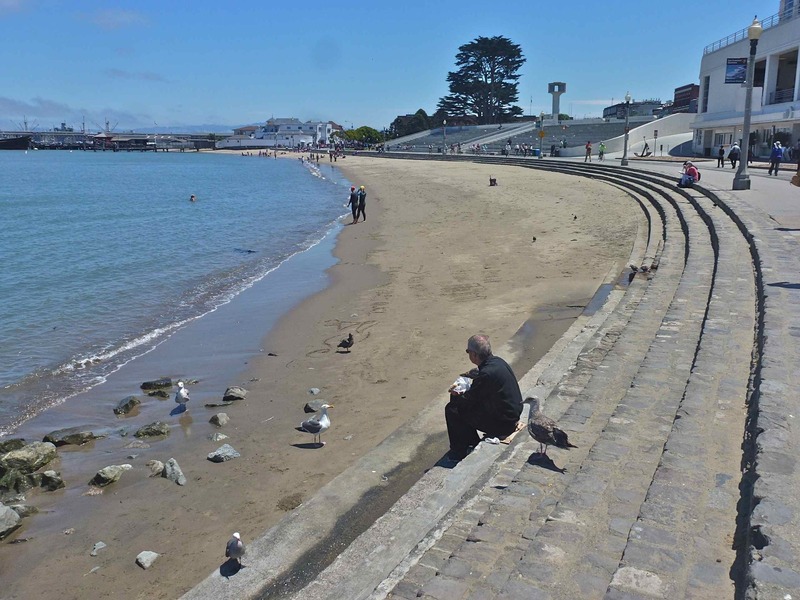 So it was as we sat on the water’s edge with our salads and sandwiches in hand – we looked back at San Francisco and admired all the beauty she had to offer. 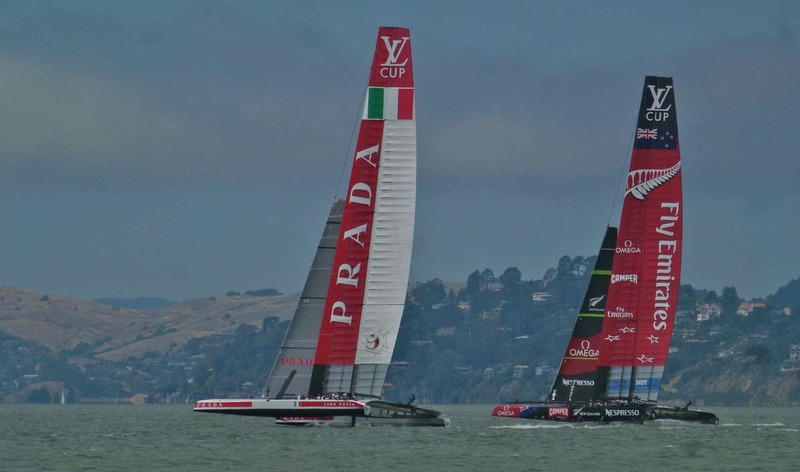 This entry was posted in cycling, USA and tagged America's cup, bicycle, bridges, cycling, life, outdoors, photography, San Francisco, travel, USA, writing. Bookmark the permalink. What did you think of SF? I commute to work, and much rather prefer biking over the bus! We loved San Fran – so much in fact that we will be returning again soon! Awesome! 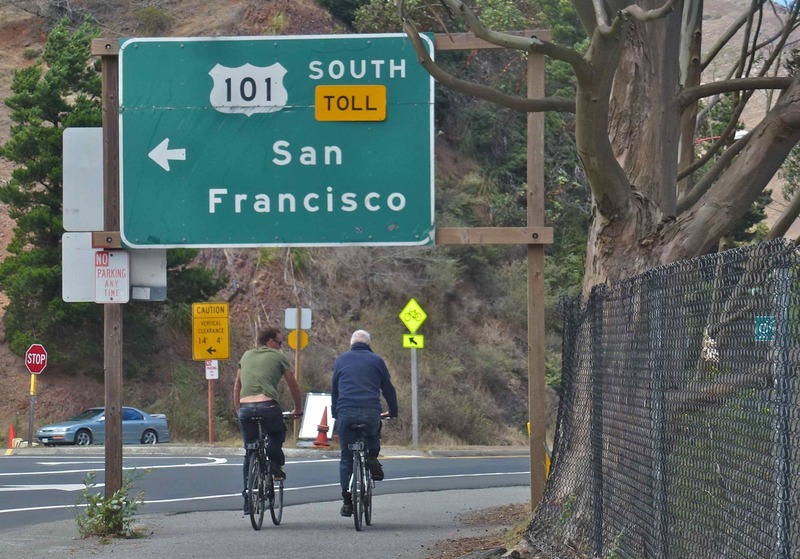 Outside of SF, where is your other favorite place to bike? 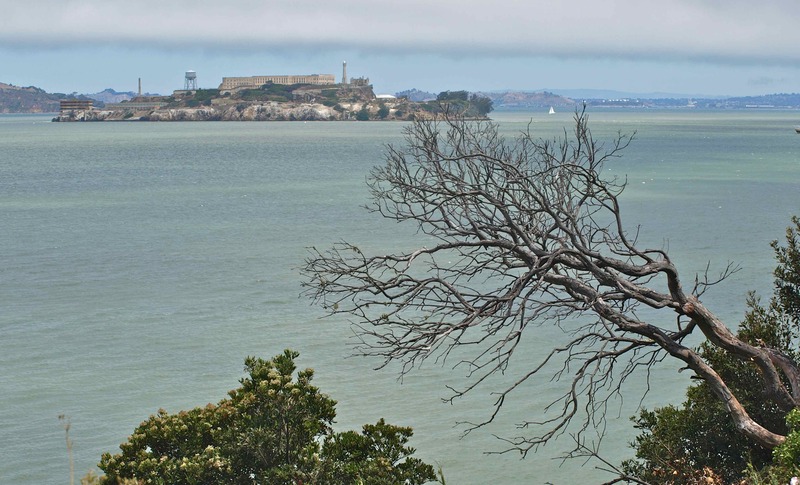 Loved San Fran – great place to cycle..
My wife and I did a California wine country bicycle tour back in the 90’s, and spent a few days in SF afterwards. I remember Fisherman’s Wharf very well. I’m sorry we seemed to have missed that penny arcade, however!! I can see you’ve still got that wonderful prose style. I was particularly fond of “the city clutters the blue sky, like a mountain range with a tin of shiny paint.” Yes, indeed! very cool i got to ride in the city last year only did about 10 miles but it felt more like 30, the wiggle was a great route too, great post keep em coming!! Thank you for the post and the pics as well. Makes me want to get there real quick like and go to all those wonderful places and see all those beautiful sites! Thanks for the San Fransico cycling chronicles. Loving it! Looks like a beautiful ride! Loved this post! I grew up outside of San Fran and never had a chance to ride in the city, but your post brought back many memories. Glad you had such a nice time. Thank you! 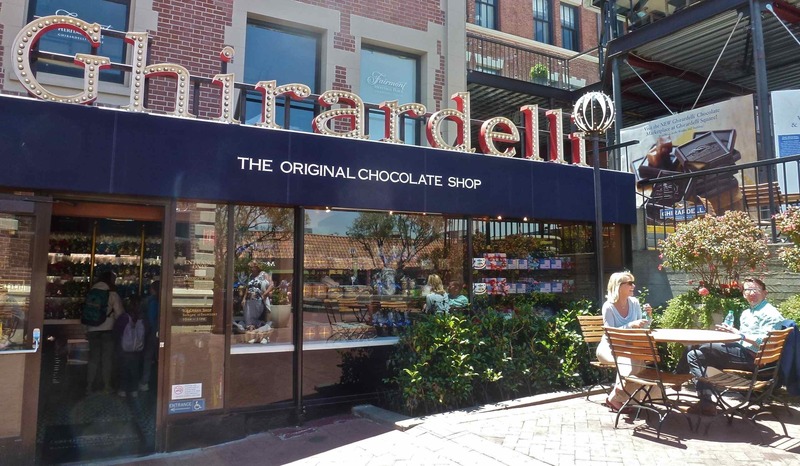 We loved our time in San Fran – so much to see and do. Great to hear from you! So pleased you enjoyed it – thanks for the comment! I enjoyed the narration. Thanks. I have part two coming soon! – thanks for stopping in for a read.